Dorothy Head Knode, my mother, the tennis star. As famed tennis star, Billie Jean King declared, “Dorothy Head Knode was tenacious.” Indeed, Mom’s unwavering spirit led her to realize the dream of every tennis player : An invite to the famed grass courts of Wimbledon. In fact, she played Wimbledon thirteen times and was given the sweet satisfaction of holding semi-finalist medals on two occasions! Courage may be inherent in Mom’s matrix. Explaining her mother's appearances in and out of her life, Mom says, "She was sort of a gypsy." Also, as a small girl, she stood firm as her stepmother literally boxed in her ears. Whenever I’ve asked about the situation, I get a shrug of the shoulders. 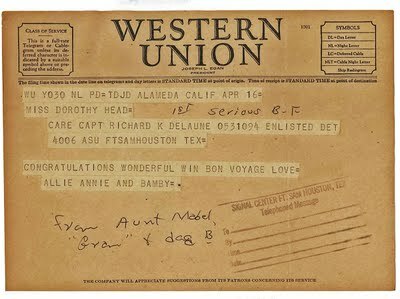 Fortunately, Grace intervened and my Great Aunt Mabel (who was great in many ways) rescued my mother and raised her in Northern California. Aunt Mabel was married but was the primary breadwinner of the house. She paid the bills with her secretarial work. One of the pleasures in her life was tennis. 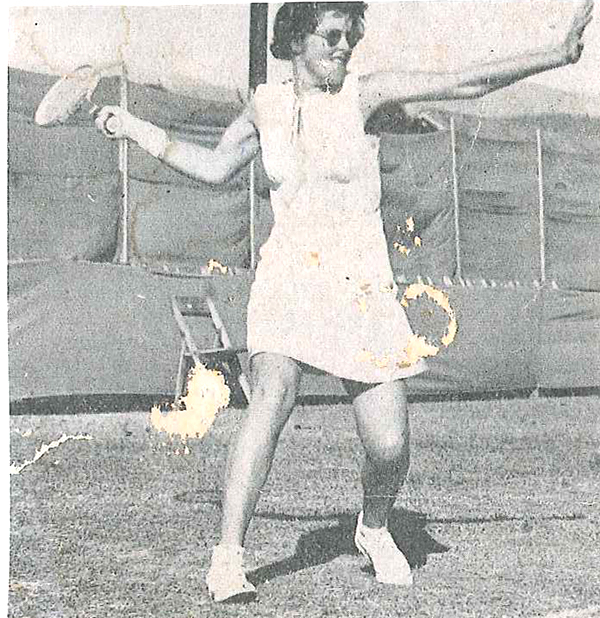 She sacrificed her own tennis lessons with famed Northern California coach, Tom Stow, so Mom could enjoy the sport. 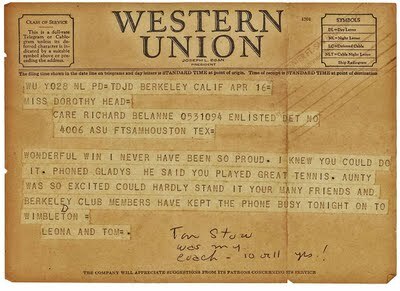 Glad to say Aunt Mabel was able to play chaperon when Mom began battling her way across America’s tennis courts to gain a national ranking. 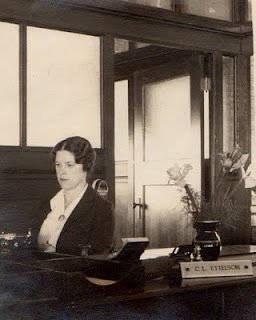 Aunt Mabel at her job as Executive Assistant to the President of Montgomery Ward. 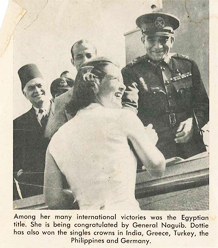 Mom shaking hands with General Naguib. Previous to the 1970s, tennis was an amateur sport. 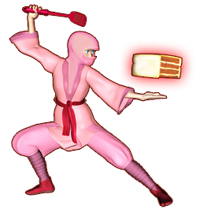 Players were prohibited from accepting endorsement deals and commercial contracts. 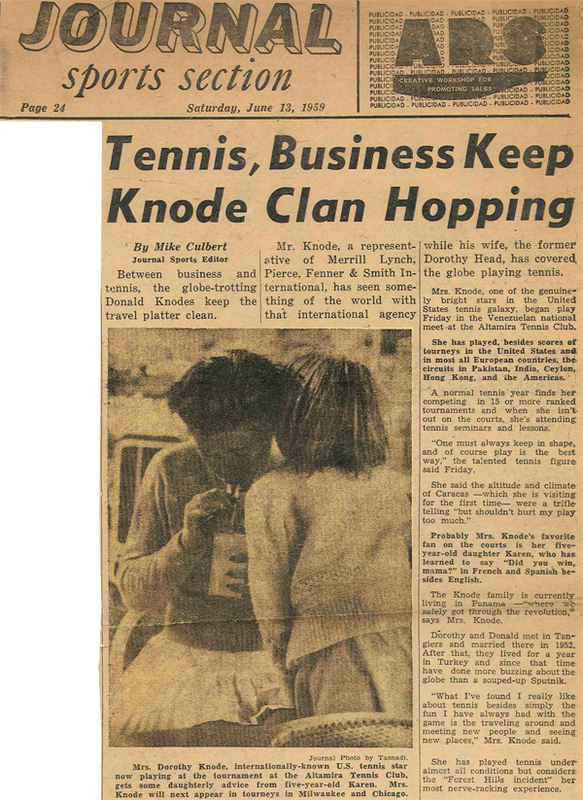 Businessmen like William duPont, Jr. who were sympathetic to budding tennis stars, hired mom. 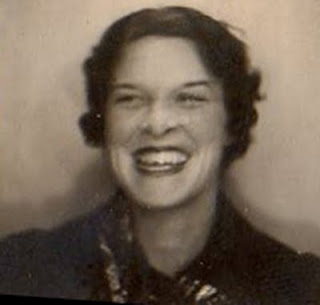 (Mr. duPont, Jr. was married for a bit to Margaret Osborne duPont, another Tom Stow protégé who won 25 US Grand Slam Championships in her lifetime.) Mom recalls taking notes in the wee hours of the morning as Mr. duPont, Jr. rode in his limo and reviewed his factories. Keeping in mind her goal of making money for tournament fees, she did the work without complaint. With her savings, Mom booked a third class cabin ticket on a freighter bound for England. (Subsequent trips to the UK provided slightly more luxurious travel and accommodations.) The multiple invites to England’s Wimbledon and America’s most prestigious tournaments, of course, kept her motivated. As well as the encouragement of her supporters. 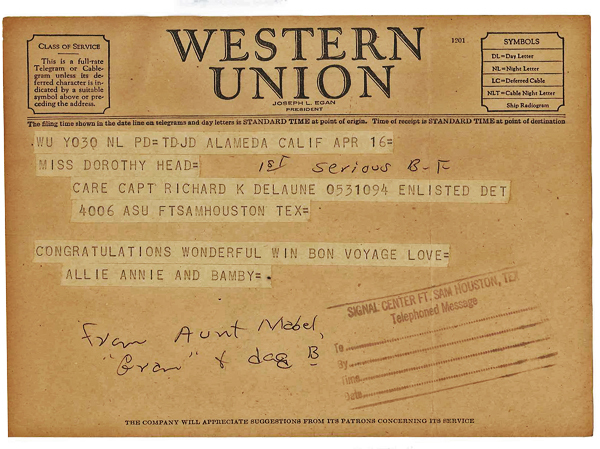 Brushing my fingers over the rumpled Western Union telegrams that were sent from Aunt Mabel and coach, Tom Stow, I still felt the pride in their congratulatory messages. 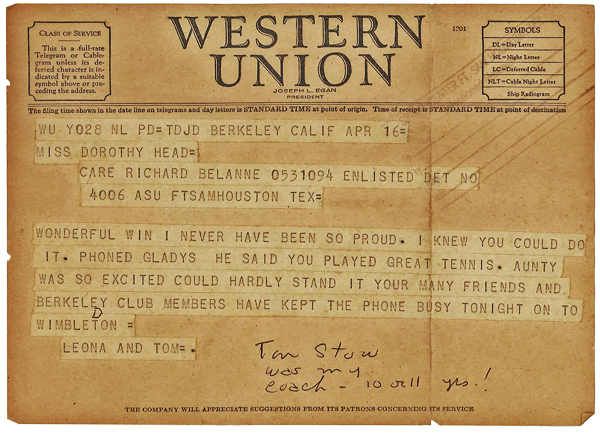 Accolades from Mom's tennis coach, Tom Stow. 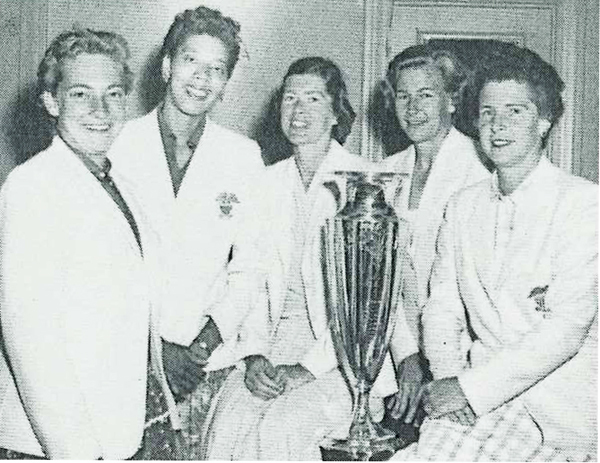 The triumphant 1957 US Wightman Team with their trophy. From left to right, Darlene Hard, Althea Gibson, Mom, Louise Brough and Margaret Osborne duPont. 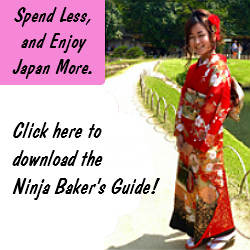 In addition to her English triumphs, in the 1950s Mom consistently ranked in America’s top ten players. She was also a runner-up in the 1955 and 1957 French Championships. She also claimed victory in the German and US Clay Court Championships. Mom’s record-setting number of Clay Court wins remains undefeated. Decades later, Mom is still dedicated to her sport. If not on the court or in the gym, she’s on the couch watching a tennis match. (If tennis is not on the screen, CNN News will be blasting from the tube.) If I happen to telephone during Wimbledon or the French Open, I am guaranteed a brief conversation. The 80s-and-over golden medal garnered in Turkey. 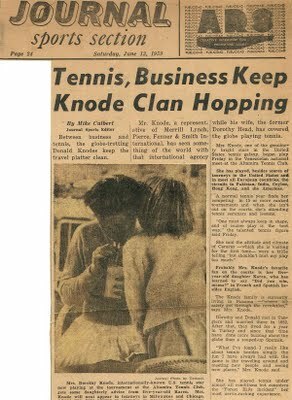 A 1959 newspaper clipping spotlighting Mom and DD#1 - my sister, Karen. DD#2 and my darling, David on either side of Mom. 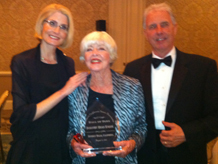 She's holding her plaque commemorating her induction into the Tennis Hall of Fame. August 5, 2011: The Southern California chapter of the USTA (United States Tennis Association) inducted Dorothy Head Knode into the Hall of Fame. Mom was in excellent company. (Yes, hubby, David and I. Tee hee.) 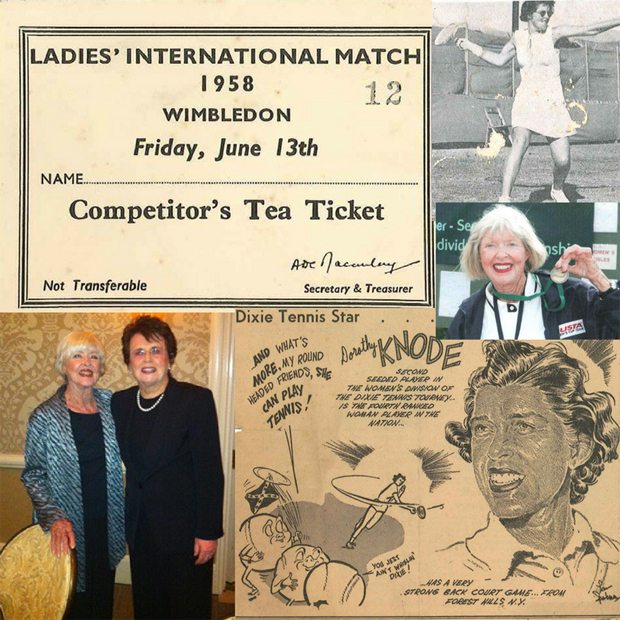 Other honored inductees included Billie Jean King, the winner of 39 Grand Slam Championships! 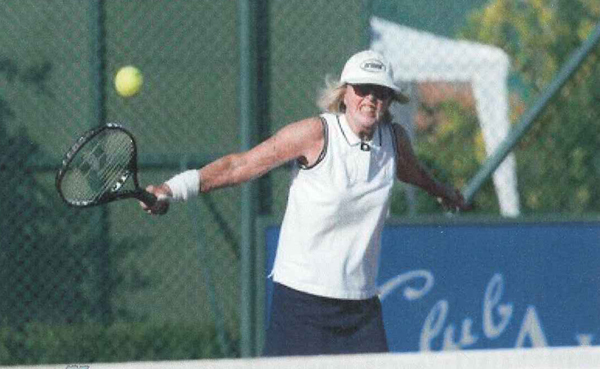 She is also famous for her 1973 Battle of the Sexes victory over Wimbledon Singles Men Champion, Bobby Riggs. Side note: John Riggs, brother of famous Bobby, gave Mom her first kiss – on the cheek. 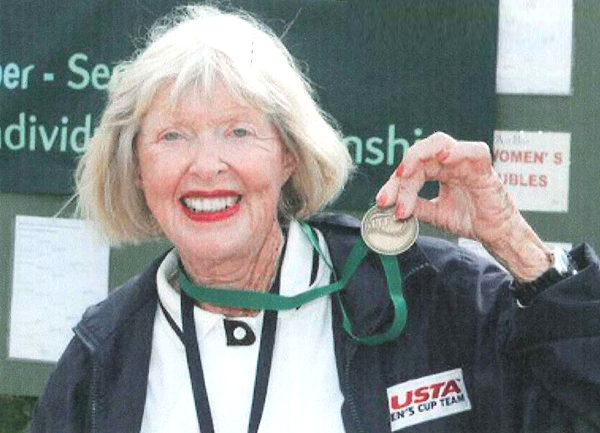 Although no kisses were exchanged at the USTA event, a video was shown featuring renowned figures from the world of tennis praising Mom’s accomplishments and abilities. Billie Jean King declared that Mom was always her “she-hero.” The USTA ceremony was held at the Four Seasons Beverly Hills. As expected, everything was gorgeous. White roses bloomed in the center of every table. And like the fresh flowers, all food items appeared to have been purchased in the a.m. from a farmer’s market. The first course was a perfectly cooked salmon with a hint of miso. Bacon bits decorated a wedge of crisp lettuce. Dessert choices included crème brulee with divine raspberries and chocolate pudding cake. Wine flowed freely. And waiters folded napkins anytime someone stepped away from the table. Sorry. In all the excitement I forgot to take pictures of the food. Aunt Mabel crossed over when I was about seven. My one precious memory includes staying at her home in the San Francisco area was when I was about five. After flying from Tokyo (with a hired chaperon) for many hours, this wonderful brunette lady introduced herself as Aunt Mabel. She hugged me and took me to two supermarkets so I could drink the coveted American chocolate milk... Even when she wasn’t literally hugging me, I felt safe in her loving embrace. 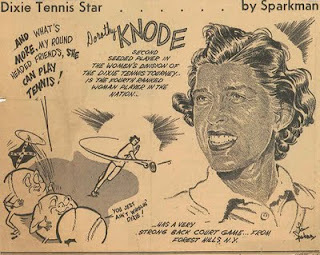 My Great Aunt Mabel also proved to be a heavenly guardian for Dorothy Head Knode, my mother, the tennis star. Wishing you angels who brighten your every day.